Choosing the right flooring material for your kitchen can really be a pain. You need something that is durable, easy to clean and looks good. A material that cushions as well can be a huge advantage as well because the kitchen is the room where we do most of our work standing up. The longer we have to stand over pots and pan or slaving over a hot microwave, the more fatigue we feel in our feet and legs. Finding a good kitchen flooring choice that eliminates some of that makes it nearly a miracle. Cork flooring is a good choice not only for those reasons, but for its many other benefits as well. Cork flooring in a kitchen. Photo courtesy of Webshots. Air pockets inside of the cork itself cushions the feet which reduces the stress on your legs and back, a huge bonus if you have to stand up for long periods of time. Cork is not made from cutting a tree down for its lumber; the bark is carefully peeled off leaving the tree standing. The tree will re-grow the bark for future harvesting. Cork floors are one of the only truly sustainable, renewable flooring choices on the market today. Because they are so soft and cushioning, many of your dropped items will not break; a huge advantage to families with the young and the clumsy. Hypoallergenic cork floors are a good choice for people who have issues with allergens such as dust mites, mold and other insects. A natural substance in the cork not only repels these irritants but lends a fire resistant property to the flooring. The air which is trapped inside the cellular structure of cork helps reduce noise. Essentially cork flooring is quiet and reduces the impact of noises such as when someone drops something on the kitchen floor, or the sound of someone walking through the kitchen. Cork flooring is a good choice for the busy homeowner because it is lower maintenance than many of the other flooring options, but is not universally ideal. If the kitchen has a lot of direct sun the floor’s color may fade over time, a consideration to keep in mind when weighing your options. It does have a unique appearance and no two cork floors will be identical. There are not as many color options, of course, but the many benefits may negate that minor drawback for most people. If you are still on the fence about cork, speak to an interior designer, (if you choose to use one), or a flooring dealer who can show you an example of what it looks and feels like before you make the commitment. The cost of cork flooring is fairly comparable to other flooring materials, but keep in mind that the lower end prices may indicate a lesser quality and performance. Weigh the cost of the mid to higher range cork floors with the life expectancy and the extra, initial cost may be worth it in the long run. Remember, the higher cost cork flooring is generally thicker meaning you will not need additional materials underneath it. It will serve as an insulating factor meaning a possible reduction in heating costs. Higher end flooring also has several layers of protective coating, usually a UV varnish which helps protect it and makes it even more wear and moisture resistant. AmCork, Evora, APC Cork and Globus Cork are some of the popular names in the cork flooring industry. They consist of both manufacturers as well as suppliers. Installation can be accomplished by the handy homeowner, but it might be advisable for the job to be given to a professional. There are two methods of installation for cork floors, the glued down flooring and the floated. Floated flooring is not glued, but snapped together in place like a giant puzzle. When deciding which method to use, consider the condition of the surface that it is being laid on. Rough or uneven surfaces almost require the floated flooring, while a smooth and flat surface are perfectly fine for either. It’s important that you strictly follow the manufacturer’s instructions while installation of your cork flooring. In addition, make sure that you are following all of the manufacturer’s recommendations for care and upkeep, to keep the cork floor looking and performing at its best for many, many years to come. In order to clean your cork floor, damp mopping and vacuuming is all that is needed most often. It’s advisable to be careful about using any type of abrasive materials, and also make sure that you wipe any spills immediately – this will help ensure that there is no staining of any kind. While cork is a cushioning surface, it’s advisable to use felt floor protectors on large furniture pieces (cabinets, tables etc) in your kitchen, as this will help avoid any indentations. BuildDirect appears to be one of the best places to buy the cork flooring from. Besides the best prices, their customer friendly policies make buying from them a pleasure. This sounds very interesting, James. 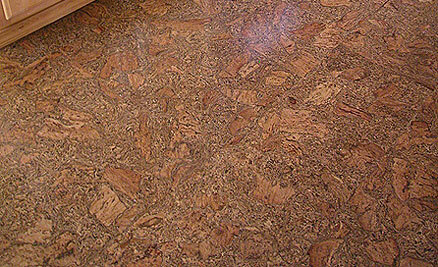 Why don’t you tell us more information about TORLYS Cork Flooring?